Princeton, 1954. Hardcover with dust jacket. Shaken, cocked spine. Foxing. 280 pages. Princeton, N.J: Princeton University Press, 1954. 1st. HB. Brown cloth, silver lettering on spine, 8vo, 280 pp. Clean, unmarked book, binding solid. Covers show minor edge wear, lettering on spine somewhat faded. Book condition VG. Princeton: Princeton Univ. Press, 1954. 280pp. Maroon cloth binding. 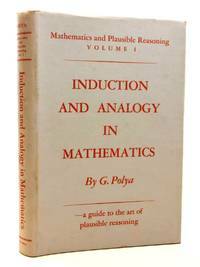 Volume I of Mathematics and plausible Reasoning series.. First Edition. Hardcover. Fine. 8vo - over 7¾" - 9¾" tall. Princeton, NJ: Princeton University Press, 1990. (1990), 280pp, illus., 'Volume 1 of Mathematics and Plausible Reasoning', light shelfwear to cover, contents clean.. Trade Paperback. Very Good +/No Jacket. Oxford University Press, 1954. Volume 1. This is an ex-library book and may have the usual library/used-book markings inside.This book has clothback covers. In poor condition, suitable as a reading copy. Princeton University Press, 1967. Volume 1. This is an ex-library book and may have the usual library/used-book markings inside.This book has hardback covers. In fair condition, suitable as a study copy. No dust jacket. Princeton, N.J.: Princeton University Press, 1954. 2nd printing (1971); dj w/unclipped price; 280 clean, unmarked pages; owner's name. Hardcover. Very Good/Very Good. 8 Vo; 2.5 Pounds. Princeton, 1954. hardback in very good condition with very good dust jacket. 2 vol set.. Hardcover. Very Good/Very Good.